We are a nonprofit organization that relies on volunteers getting involved so we can offer support and information to our member families and the general community. Please consider contributing your time and talents! Help children learn to ride a two-wheeler. Each summer, the Autism Society and the Down Syndrome Association of Wisconsin sponsor iCan Shine bike programs in our area. This is a five-day program that teaches children with developmental disabilities to ride a two-wheel bike. We need volunteers who can run alongside the campers on their bikes as well as general volunteers to help with set up, check in, etc. This is a great service project for High School Students if you can commit to a two-hour slot for five consecutive days. It’s great exercise and very rewarding! This year we are in Elkhorn at Lakeland School June 18–23. One more camp is also in the works so stay tuned for more information. Call or email us for a volunteer application today! 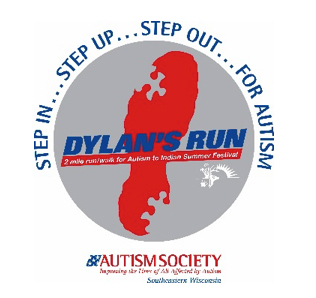 Watch for the 2017 event: Dylan’s Run to Indian Summer! If you are interested in helping out at the event, please click here for more information. We usually need help with people on-site to time the runners, assist on the course directing participants, staffing water stations and in many more areas.